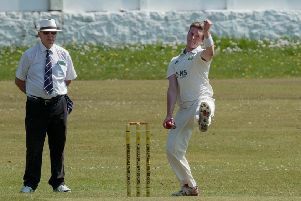 Clitheroe’s Luke Blackledge is hoping to keep himself busy throughout the 2015 season. The 24-year-old has been added to the list to feature in Preston as boxing returns to the city’s Guild Hall on February 28th. Blackledge will appear alongside the likes of Skakeeb Ali, Scott Moonan, Tomi Tatham, Morgan Jackson, AJ Faizy, Kurt Grieve, Ricky Gooding, Isaac Lowe and headliner Ricky Skelton as VIP Promotions, in association with Karl Ince, present ‘Boxing is Back’. The three-belt super middleweight will then make the defence of his latest acquisition - the WBC International Silver strap - at Blackburn King George’s Hall where he’ll top the bill on an unconfirmed date in April. “I only had four fights last year so I’ll be looking to double that this time,” Blackledge said. “I like to keep active because it keeps me disciplined, focused and in the gym so I’m always improving. Every fight helps with my experience. Alex Matvienko’s student had been penned in for a trip to Germany as Arthur Abraham stepped up his preparations for his rematch against Paul Smith, with the WBO World super middleweight title on the line at Berlin’s O2 World Arena. However, Blackledge’s revised schedule scuppered such plans. Meanwhile, the British Masters and International Masters champion looks set to reject proposals to take on WBF world champion Francis Cheka in Tanzania and Isaac Ekpo in Nigeria. “I’ve just been offered a fight in Tanzania to fight Francis Cheka who has a really good record,” said Blackledge. “He’s won 30 and stopped 16. I think I’d beat him if I was given enough time to prepare. Tickets for Blackledge’s next fight stretch from £30 (general unreserved seating) to £90 (ringside table). Anybody interested in purchasing tickets, or sponsoring the WBC International Silver supremo for the new season, can contact him on 07731 542103.